30's-40's satin dressing gowns, preferably prints! Discussion in 'PUBLIC Most Wanted - Looking for something?' started by Robin of Frocksley, Sep 11, 2015. I am a sucker for lovely robes, and am in need of another one (or two!). The trick is that I wear them regularly, so I always look for ones that aren't in perfect condition/are well-worn. I prefer an all silk robe with sleeves (puffed or long) and a sash. A front zipper is a major plus; my favorite robe I own is a zip-front silk floral print Saybury gown from the 30's. Quilted or lace details are always wonderful. As I said, I'm particularly interested in gowns that have been lovingly worn. Thanks so much, and I'm happy to post pics of my favorite robe if that helps! Hi Melanie, thanks for replying. I'm excited that you have a few. My phone is acting up, so I can't load photos today but will post them ASAP. For now I can describe it as a zip-front floral silk gown with a small rounded collar (almost a Peter Pan style), a matching sash belt and cuffed puffed sleeves. Thanks again, and I'll post pics as soon as I can. Neither of mine are silk - would you still want to see them? One is cotton the other rayon satin both have zip fronts and floral pattern but they are very different looking. Dressing gowns are every day garments and washable, so very rare to find in silks which would need dry cleaning. My favourites are floral rayons (the cool, silky sort). I have several Sayburys in my wardrdobe because I love them too but all the ones I've seen have been rayon. The Vintage Merchant and Robin of Frocksley like this. Actually, I found the photos anyway, both 1940's, red is cotton, purple is rayon. Better Dresses Vintage likes this. Thanks so much! I really prefer silk. 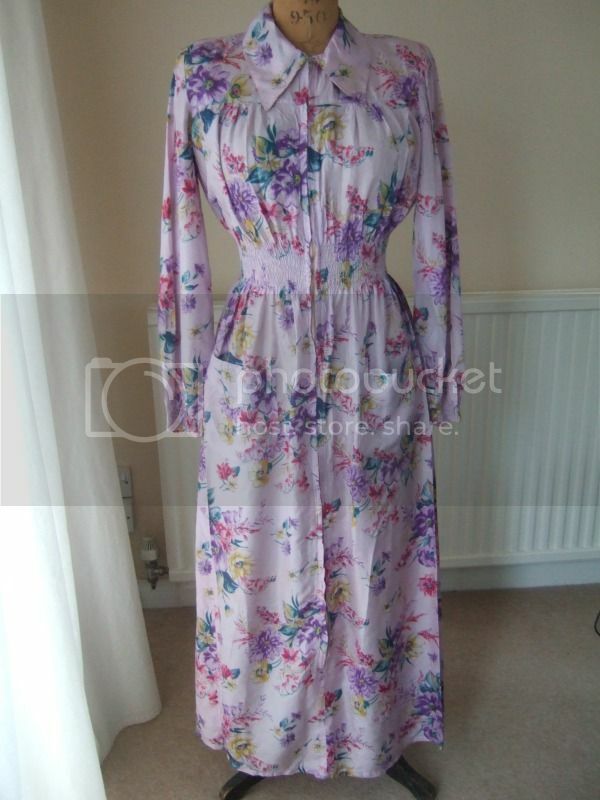 Both gowns you posted pics of are lovely, and I particularly like the print on the purple one. I'm hoping someone will turn up with a silk one. Thanks again! carla rey and Circa Vintage like this. Thanks again, to both of you. Your replies prompted me to do a burn test on my favorite gown, and it turns out it is a rayon satin. I'm still learning about fabric identification, and would have never thought rayon could so closely approximate the look and feel of silk. Now that I know that, I'm totally open to rayon satin robes. How can I find out more (size etc) about your purple floral number, Melanie? I'm hoping to collect a few so I can cycle through wearing them, so would love to see more from anyone. Thanks so much again! The rayons of the '30s and '40s are really beautiful - nothing like modern rayons (they changed the recipe in the '50s to make it more robust). Vintage rayons are soft and silky, often called "silky rayons" or "cool rayons". They drape and feel beautiful on. Great selections Melanie. I love them all! I'm always in the market for these too, although I need a bigger size. The Vintage Merchant, carla rey, morning-glorious and 1 other person like this. Robin I have sent you a PM with details. Also, I hope you don't mind, I edited this thread title to reflect the change in your requirements. Robin of Frocksley likes this. Here (finally) are pics of my favorite dressing gown. My favorite things about it are the print and the lightly puffed (but not padded, I'm not keen on shoulder pads) sleeves. It's in pretty sad condition, but still very wearable. I love hanging out in this robe all day, and only feel comfortable doing so because it's shabby. I've included pics of the two largest (the big one is the size of a quarter) holes (which I really ought to have mended forever ago) to give an idea of the kind of damage I won't bat an eye at. I love all of the dressing gowns linked, but they're all in such beautiful shape that I'd never wear them. I know most if not all of you experts collect only pieces in good condition, but I'm hoping someone has some sad gowns squirreled away. Thanks again to everyone for helping! I have a 30s/40s one that's very worn in! It didn't post earlier because I thought it might be too far gone for you. It won't last much longer, as the seams are beginning to go, but you could give it last final outing? It's lightweight rayon satin and a paisley pattern in yellows, creams and oranges - the overall effect is subtle yellow-gold. No zip though, it has cross over front with a tie waist. it has slightly puffed sleeves. What approx size do you need -it will fit up to approx a UK 12. I'm in the UK too, so that makes things easier. Let me know if it sounds possible, and I'll post pics. All of these gowns are so lovely! However, I really wouldn't want to muck around the house in one that is in such nice condition. Ruth, this sounds absolutely perfect! Yellow is my favorite color. Please do post pics! I am short (5'3"), so would love to know how long it is. Retro Ruth and The Vintage Merchant like this. Great, I'll take some rough pics, measure, and come back to you! Not today as the light has gone (absolute downpour here!) but soon. I'm 5'8" and it reaches mid-calf on me, so I think it'd be nicely ankle length on you. Well, you did say you wanted 'lovingly worn'! It has various holes and tears. The worst are: two patches of larger holes near the hem, a tear along one under arm seam, and a tear to tie belt, tear at back of neck under collar, small holes on one side of the pointed collar. The seams are beginning to go in places. There are also some period repairs where someone has lovingly darned the fabric in yellow thread to strengthen it where it was weakening. The print has faded a little here and there. I've photographed all the major and large flaws. There may be some things I've missed, but I hope these give enough of an impression of the state it's in! It is almost certainly home made. 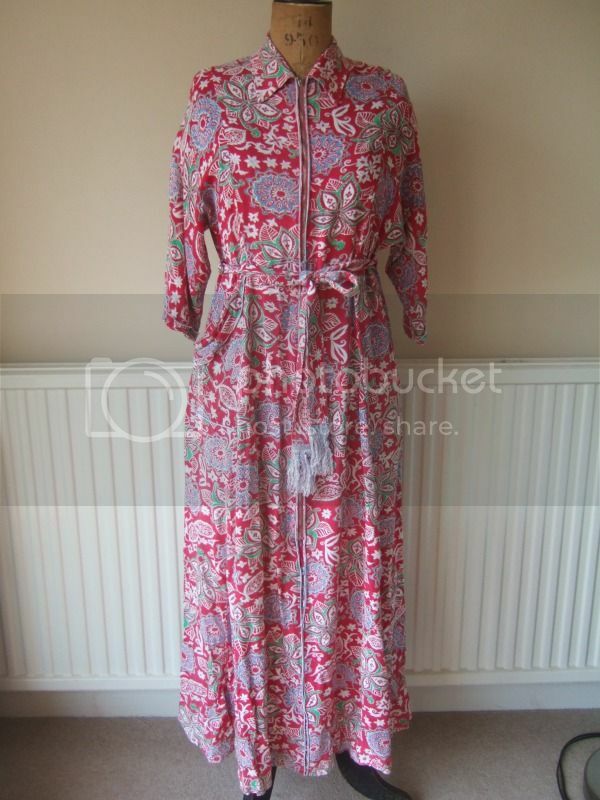 The fabric is lovely, lightweight paisley printed rayon. The sleeves are only very slightly puffed. It has an inner tie, and the outer tie belt is attached at the back. Bust: 41" Waist: 33" - both measured from seam-to-seam at the back and doubled. With the cross over front there is quite some flexibility, and it's meant to be worn loose. Let me know if you need more measurements or any further info. I will understand if it's too far gone for you! But if you want to give it its swan song, let me know. Ruth, sorry it's taken me so long to reply. The gown is perfect! I love it. Please let me know if it's not too late. Thank you so much! Great! No, not too late. I will pm you to arrange details.